wellcome to my fourth review in this series where I take a look at the kids games we play in order to help you deciding if they are worth buying. 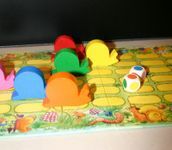 The game comes with an elongated board with very cute illustrations on it, two wooden color dice and six wooden snails. These snails are pretty chunky and are ideal for smaller children to play with. The quality of the components is very good. We got our copy second hand and it had seen quite some play before we got it, but the board and the wooden components still look almost prestine. The cardboard insert is the only part of the game that shows its age but even this one stays better in shape than the comparable inserts from HABA. Thumbs up for the components. This game is for 2-6 players and plays in about 10 minutes. It is an extremly simple racing game and as such might be a good starting point into the genre. The six snails are placed on their individual racing tracks and the players take turn rolling the dice. Based on the colors the dice show one or two snails are moved along their tracks. This continues until all snails have reached the finish line and can eat the juicy salad. Who is the winner? The first and the last snail win the game. Does any player win the game? No. Is there any way to influence which snail is winning? No. This game is a very boring ordeal. As the players do not control the snails directly they are not invested in the game. And as there is no way to mitigate the luck of the dice rolls the game essentially plays itself. Watching the snails race along their tracks and guessing which one might win can be fun for a while, but as soon as games become available that offer at least some decisions the young gamers will hardly pull out this game anymore. If this is the very first game to ever buy for your kids and your kids are still small enough to enjoy it Snail's Pace Race might be a good fit - especially if you can get it for cheap. But I would not recommend this game at full retail price as it just offers too little. You could get Caterpillar Dice instead, which teaches the same concepts, has the players better engaged and comes in a much smaller box. And I would not recommend it for children older than 3. Our son played it as his second game and it was fine for a while. But I think we have never played it again since he was 2.5 years old. HOWEVER - the wooden snails are nice and we use them now for a proper racing game I have designed for him. So, if you can get the game for a buck or two, those snails might be of interest for you. I hope this brief review helps you finding the best children games and avoiding the not so good ones. This is key - I used this game with both of my kids at 2.5 years and it's a FANTASTIC way for them to understand the concept of waiting for their turn, identifying colors, moving their snails just 1 space, etc. I have a video I took of my son at 2yrs playing this with me that I'll cherish forever. Whenever anyone asks me for kids games, if they have a 2 year old or under, I tell them they have to get this. Sure it's boring for anyone over 3 years old, but it's wonderful for a 2-year-old. I think games like this can be as boring or "fun" as you let them. I've played it with my kids when a little older than 3, and I keep it interesting by narrating it, adding some "flavor". Half the fun for them is listening to the silliness. I can agree with both replies - yes, it offers some valuable lessons for very young gamers and yes, every game will gain or lose depending on how you play it. It is not a terrible bad game and we will play it with our second child as soon as she will be old enough - especially as the components are very sturdy. But the MSRP in Germany for this game is 23 € and there are more affordable games out there that can teach the same lessons (like Caterpillar Dice). Snail's Pace Race is a nice stepping stone but I would rather play a more engaging game - Orchard for instance would be the perfect next step up as it mixes color matching with an cooperative approach, token management and puzzle aspects. And Orchard lends itself very well for a nice narrative element.